There are new scar trees in Canberra. They face outward from the Tent Embassy towards parliament house. 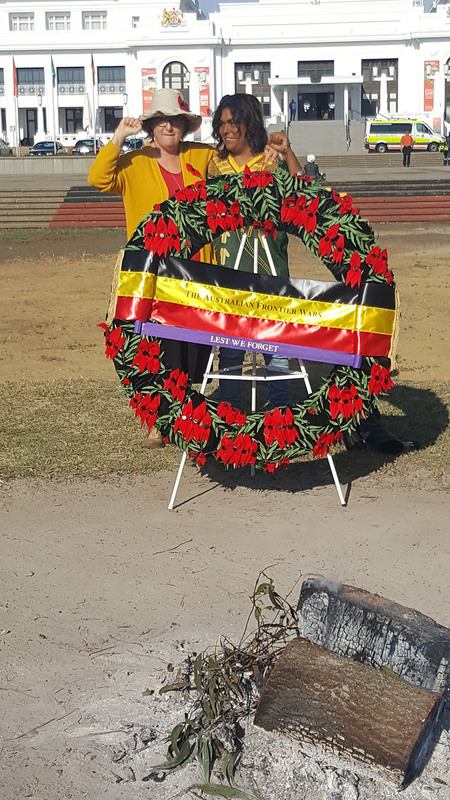 The shields cut from the trees were soaked to carry sacred fire from the Embassy to the Frontier Wars March on Anzac Day. When you sit at the Embassy at night, you see parliament house for what it is, a shadow. Blazed with light, empty of all meaning now except deception. The statue of King George, on its giant sandstone blocks (meant to awe us all with its strength and staying power) is insubstantial too, devoid of life. Behind it all stand the corporate inheritors of invasion, the ruling class. The Frontier Wars March and the Embassy stand for a different power, the people uniting for take this country back. ‘I carry allodial title, the oldest living lore,’ Uncle Marbk says. Allodial lands are the absolute property of their owner and not subject to any rent service, or acknowledgment to a superior. On Ngunawal land, this is a women’s sacred site. Embassy Firekeeper Gumbaynggirr man Roxley Foley says bad things happened here, that the feeling comes through the ground. And it’s clear living here is no easy thing through winter, when visitors are few, and homeless people arrive in need of a warm fire and drink. The Embassy has been here since 1972, its sacred fire burning for the last twenty years. Today small campfires bring people together from all over Australia. Fires are tended each day, wood chopped and delivered by both elders and youth. Middle generations like Wiradjuri artist Ricky, who now lives at the Embassy, and whose family visits from Cowra, don’t sit after breakfast until the daily tasks are done. At night the camp is alive with small lights. 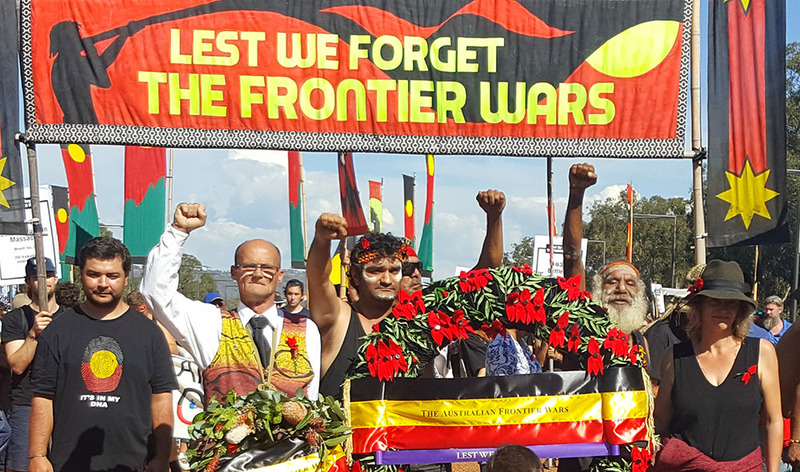 Despite shamefully delayed recognition of the Black Diggers, both men and women, the Frontier Wars’ marchers stand behind a wire fence during Anzac memorials, like fringe dwellers kept out of country towns. Their message, National War Memorial boss, Brendan Nelson says, without hint of shame, belongs in the Australian Museum, not the War Memorial.